Your teeth are sharp but they’re not meant to bite down on anything that isn’t food! Using your teeth to tear open a package, biting your fingernails, or chewing on the tip of a pen are all terrible for your chompers. The tip of your teeth are sharp, but they’re weak. Therefore, using them to do anything other than chew food can lead to chipping or breaking. Even worse, biting your fingernails can cause gingivitis. Try sugarless gum the next time you have an urge to chew on something and keep a small pair of scissors with you to avoid using your teeth as a tool. Brushing and flossing are important for strong teeth, but not if you’re brushing too hard or not enough. The recommended amount of brushing is twice per day for two minutes at a time. After you brush your teeth, you should spend thirty seconds to one minute flossing. If you’re cleaning your teeth once a day or less, plaque will build up on your pearly whites. If you’re brushing more than twice a day, you may actually be doing your teeth more harm than good. Using a tough-bristled brush and aggressively scrubbing your teeth can wear away enamel and cause your gums to recede. Be sure to brush your teeth the recommended amount and do not scrub too hard at them. Use a moderate amount of force and always follow up your brushing with some simple flossing. Sticky, sugary, and acidic foods are a tooth’s worst nightmare. While you think you may be doing the right thing by drinking fruit juices and eating gummy vitamins, you could actually be causing your chompers some harm. Sugary and sticky foods cause bacteria to build up and lead to cavities. Food with high acidic levels tear away at your enamel, making your teeth more prone to damage. Of course, we don’t expect you to cut out every item of food that could cause damage to your teeth. Just make sure you take everything in moderation. When you eat something sweet, sticky, or with a high acidity level, give your chompers a thorough brushing afterward. We live stressful and fast-paced lives, but don’t let anxiety take its toll on your chompers. Grinding or clenching are some of the worst things you can do to your teeth. It wears them down, making them lose their protective layer. It leads to enamel erosion that causes your teeth to crack and chip over time. You could be clenching your teeth while you sleep without even realizing it. If you experience soreness in the morning or wake up with clenched teeth, then you’re most likely grinding your teeth at night. A specialty mouthguard can help you stop grinding your teeth while you sleep and protect your pearly whites from further damage. This is one of the easiest ways you can prevent harm to your teeth, yet so many people fail to do it! 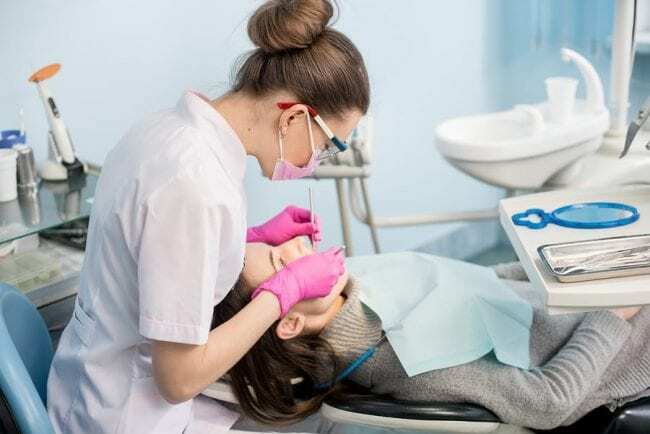 Just like you should be seeing your doctor to ensure a healthy body and taking your car in for annual inspections, you should be seeing your dentist to guarantee that your oral health isn’t in jeopardy. Losing teeth, gum disease, and oral cancers are all-too-common, but keeping up with regular dental visits helps detect abnormalities and keep you as healthy as can be. If you can’t remember the last time you saw your dentist, then you’re due for a visit. Schedule an appointment with the team at Cirocco Dental Center and we’ll make sure your oral health is in tip-top shape! PreviousPrevious post:Cavity Q & ANextNext post:How Can Eucalyptus Oil Help Your Teeth?